Parthiv Patel of Bangalore Royal Challengers (RCB) shined in the match against Rajasthan Royals on Tuesday. Patel scored 67 of just 41 balls with the help of nine 4s and one six. Thanks to his knock, RCB reached the total of 158/4 in alloted 20 overs. RCB again got off to a weak start after they lost quick wickets at the start. 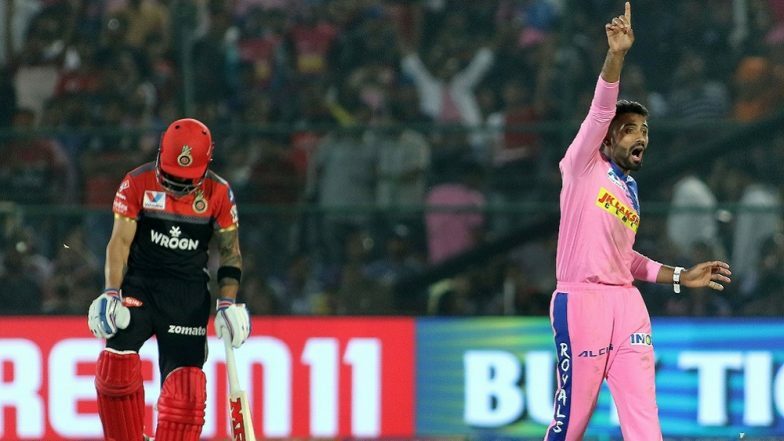 RR vs RCB, Live Cricket Score of IPL 2019 Match. Virat Kohli and AB de Villiers were dismissed by an excellent spell by Shreyas Gopal who got both the batsmen out. Royal Challengers Bangalore vs Rajasthan Royals Live Cricket Score 14th T20 Match. Shreyas Gopal ended with figures of 3 for 12 in his four overs. However, some late hitting by Mark Stoinis saw Bangalore Royal Challengers set the target of 159 for Rajasthan Royals to chase. Rajasthan Royals Playing XI: Ajinkya Rahane (Captain), Jos Buttler, Steven Smith, Rahul Tripathi, Ben Stokes, Stuart Binny, K Gowtham, Jofra Archer, Shreyas Gopal, Varun Aaron, Dhawal Kulkarni. Royal Challengers Bangalore Playing XI: Parthiv Patel, Shimron Hetmyer, Virat Kohli, AB de Villiers, Moeen Ali, Akshdeep Nath, Marcus Stoinis, Navdeep Saini, Umesh Yadav, Mohammed Siraj, Yuzvendra Chahal.